The current offer from Walmart that includes a $100 gift card with the purchase of a 40GB Playstation 3 has been sold out online. The gift card offer is still available in-store where the PS3 model is in stock. But rumors of Best Buy offering the same deal in stores seem to be just that, rumors. 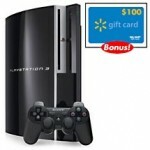 A Best Buy employee confirmed that while the company does offer competitive pricing, they “do not match gift card offers.” Walmart’s retail price of the PS3 40GB does however match Best Buy’s retail price of $399. We’ll have to wait and see if Best Buy or competing big-box retailer Circuit City come up with any of their own deals. Just to give an update, I checked the Walmart site and the 40GB is back in stock. We are offering the gift card offer on a case by case basis, and until the local market walmarts run out of stock. I work there and have already done this deal a few times. really? i called best buy today and an employee told me they were doing it sooo whats up with that?